I kind of expected choppy action today after having a large bounce in the markets yesterday and it being the day before Options expire. I was up as much as 600, but then I lost some profits after I tried shorting(reversing from a long) too soon around the signal at 8:30am. 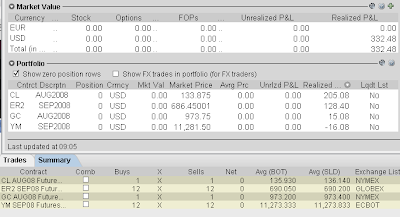 I ended up losing about $180 on YM on that trade. The NYSE A/D ratio is slightly bullish today. 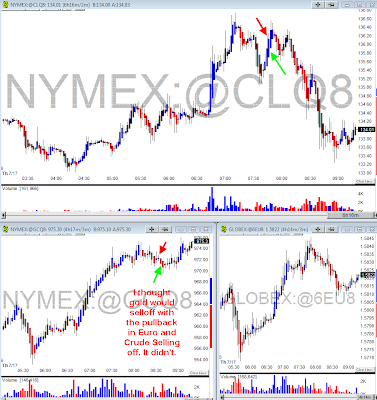 I got a 20 cent scalp on Crude Oil before we sold off. 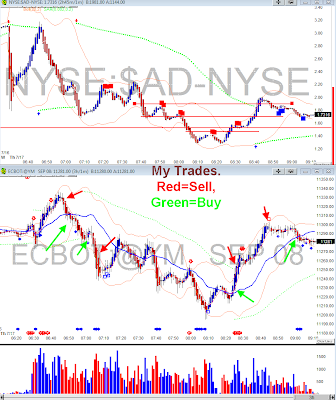 My scalp on Crude Oil was a long, and my trade on Gold was a short. Both positions would have been wrong if I were still holding them. The bond futures are down again today. I expect Bond Yields to rise over the next few months. I'm not sure whats a better bet, (ie long term bonds or short term bonds). I think the FOMC will raise rates at the next meeting, and as noted in some of their FOMC minutes, they may raise rates aggressively to combat inflation and a crumbling US dollar. The effect of raising rates on Mortgage rates will probably make the housing market even worse. This is probably why Bernanke and Co have been holding rates steady, moreover; I imagine they see the housing market as a bigger threat to the US economy right now than the US dollars decline. Virtually nobody thinks that the Fed will raise rates at the August meeting. If you believe that they will, you can sell Fed Fund futures, risking about forty dollars a contract to gain about nine-hundred dollars a contract. I happen to have very large bets that the Fed will not raise rates the rest of this year.